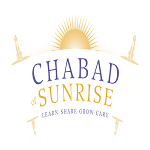 Chabad of Sunrise is dedicated to providing meaningful, inspiring and enjoyable programs and events to Jews from all walks of life in the Sunrise area. These include year-round holiday events, bi-weekly educational classes, lectures, Shabbat dinners and services. Thank you for your generous support of Chabad of Sunrise as we build on the accomplishments of the past and continue the future growth of Jewish life in the Sunrise area. We could not do it without your generosity! Every gift, large or small, has a great impact in enabling us to continue to build and expand our efforts to service every Jew we come across..
*All donations to Chabad of Sunrise are tax-deductible.